Due to its geomorphology, Kalymnos is considered an internationally recognized destination for alternative holidays, perfect for lovers of climbing, diving, trekking and speleology. The rocks of the island make the island ideal for climbers. There are over 3,000 climbing routes varying in difficulty, mainly in the western and northwestern part of the island. Another way to fully explore the island is trekking- follow its numerous mapped paths presenting unique and varying landscapes and views, that change according to the time of the year. There are trekking routes lasting from half an hour up to three hours, where you can find yourself alone in the nature. Horse riding is also an option, if you or your kids prefer – Kalymnos is perfect for family holidays in Greece. Kalymnos tradition in diving goes a long way back in time, as Kalymnians used to make a living out of sponge diving. You can learn how to free dive in one of the most respected diving schools in Kalymnos. Speleology is not organized on the island, but there are a lot of caves to visit. Kefala’ s cave is the only one with a path, but you can access many more: Seven Virgins cave and the caves in Skalia and Pserimos are only some of them. 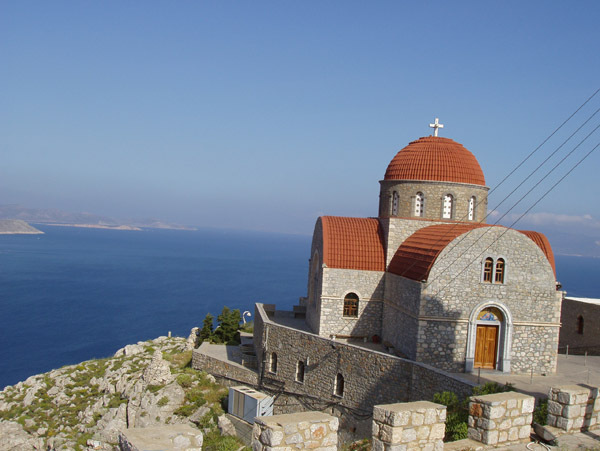 Kalymnos has a few notable museums such as the Archaeological Museum, and the Sea World Museum Several monasteries -St. Savva and more- as well as numerous chapels located in scenic locations are worth visiting. Kalymnos stands out for its natural beauties and its’ residents hospitality and is suitable for alternative, quiet and peaceful holidays. There are many interesting sightseeing spots in Kalymmos – choose according to your preferences. Due to the well-established sponge commerce, the island has 3 Sponge Factories that you can visit. There you can watch the traditional process that turns the ‘wild’ sponge to the one we use. In Pothia there is a small Archeological Museum, new and well-made, with findings from the sea and the area around. There is also the Folklore Museum which is actually a traditional kalymnian house. The visitor can see the way the sponge divers and their families lived, just a few decades ago. The tools, the everyday objects they used and the special arrangement of the house will transfer you to another era. The Sea World Museum in Vlichadia has a unique exhibition of a private collector. It includes various sea findings from exotic islands around the world. There are a lot of monasteries and churches. You can discover a lot of the chapels of the island while trekking in Kalymnos. The great Monastery of Agios Savvas is the biggest one and is overlooking Pothia. In Vothini you can visit the cave where Saint Katherine lived and the women’ monastery of the area. Another interesting place is the Temple of Christ that was actually built on top of the temple of ancient god Apollon, the ruins of which are still present.